My father never owned a car, so I learned to drive at a storefront auto school on Pitkin Avenue. The school car was a 1957 powder blue and white Dodge sedan. It measured just under a city block long, and required a team of four with walkie-talkies to parallel park. My lesson was supposed to last 30 minutes, but my instructor, a nice enough guy, was going through a nasty divorce and he needed a shoulder to cry on. While he verbally abused his soon to be ex-wife, we went for long drives into Long Island, sometimes for as long as two hours. I don't know how he squared the long lessons with the school, but I got a lot of much needed practice. I easily passed my driver's test and soon had my license. Trouble is I had no car. Enter "Tony Boots", my father. (See 9/26/08 post.) My father had no license, but I convinced him that if he went halves with me on a new car, he could get free lessons from me and all the practice time he wanted. He bought it, bless his heart. We decided on a brand new 1961 Chevy Impala, black with a red and white leather interior. It cost us all of $2200; you can't get a decent radio for that these days. I soon learned that teaching my father to drive would not be easy. His attitude was: "How hard can it be if you can do it". Unfortunately Dad had no aptitude for driving, and refused to take any direction from me. We used to drive around areas like Canarsie and Flatlands, which at that time were quite open and traffic-free. If you go to those neighborhoods today, at a time when it's really quiet, you can still hear the ghostly screams of pedestrians as they dove out of my Father's path. In spite of my urging that he needed more practice, Dad made an appointment for his road test. I went with him, and on his return, asked him how it went. "It's in the bag" was his reply. (I later learned that he had slipped the road test administrator five bucks, and assumed this would compensate for any people he had killed in the course of taking the test.) Sadly he failed, never got his license, but good sport that he was, kept up his half of the car payments. Five friends and I used to rent a bungalow in Lake Ronkonkoma. The landlady was a sweet old thing named Mrs. Fabris. She needed the rent and was smart enough to stay away during our weekend parties, unlike the Suffolk Police who regularly responded to noise complaints. We used to frequent a local bar and dance club to meet girls and do the Twist, the dance craze of the day. Drinks at the bar were expensive, so we usually got a "head start" at the bungalow and then drove over. I know, not one of my prouder moments, but drinking and driving was taken less seriously in the fifties than it is today. The bar wasn't far and we always made it there and back with no problems. One night, in my new car, I was following a friend who knew some back roads to the bar. He was travelling too fast for the unlit roads we were on, and at one point he swerved into a turn and narrowly missed entering some woods. I was a bit behind him and swerved too, but not in time to avoid the woods. I hit a tree with enough force to knock it down, but being sufficiently "relaxed" from the drinks I'd had, I just bounced off the steering wheel without a scratch. Not the same could be said for the car; my sweet ride was totaled. Unfazed, I left the car to spend the night with the tree while I Twisted into the wee hours. In the cold light of morning, I shook the cobwebs out and formulated my plan for breaking the bad news to my folks. When I got home and saw my parents, I would feign an injury hoping that their concern for me would overshadow their annoyance about the car. I made up a "George Costanza" story about sustaining a shoulder injury after being cut off by a bunch of wild teenagers and forced off the road. I'm not proud of the stupid thing I did, or lying to my parents about it, but on the plus side, the plan worked like a charm. My mother fussed over me, the insurance company paid to have the car repaired, and we all lived happily ever after. Looking back on some of the incredibly dumb things I did in my youth, I have come to believe that God has kept me here for some purpose. Maybe it was marrying my wonderful wife and bringing three exceptional children into the world, or maybe my reason for being has yet to be made clear. At any rate I'm still here, and Lord, if there's something you need me to do, I'm your guy. 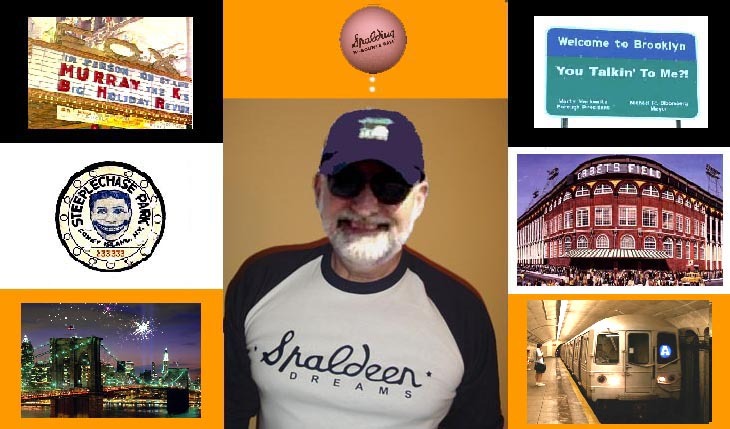 SEE DATES ABOVE RIGHT FOR OTHER POSTS FROM "SPALDEEN DREAMS". Your purpose is to be the guy who stands in line while the register receipt is being changed. Oh and being an incredible father to the 3 exceptional children (all gifted, of course). Yes, there is the receipt business. Thanks my gifted child.